In the early 1980s, advances in analyses of microbial function in ocean water allowed researchers to observe that smaller microbial producers–distinct from well studied photosynthetic dinoflagellates and diatoms–were leaking a substantial amount of dissolved organic carbon (DOC) into the water column. This DOC was then taken up by heterotrophic microbes, who were in turn eaten by phagotrophic protozoa, who were then finally consumed as an additional food source by the primary consumers of the traditional food web. This previously unobserved pathway for transfer of energy and key elements like C and N appeared to operate in parallel to the traditional food web, and was thus named the “microbial loop.” The microbial loop was eventually shown to account for a substantial amount of the C and N cycling and storage in ocean systems, changing our basic understanding of ocean biogeochemistry. The idea of parallel cycling “loops” has since caught on in biogeochemistry as a way to describe alternative and previously underappreciated cycling pathways. I’ve recently been working with ecologists at the University of New Mexico who have been developing the analogously named “fungal loop hypothesis.” About a decade ago, they began to synthesize evidence suggesting that fungi were an unusually important part of C and N cycling in desert soils. 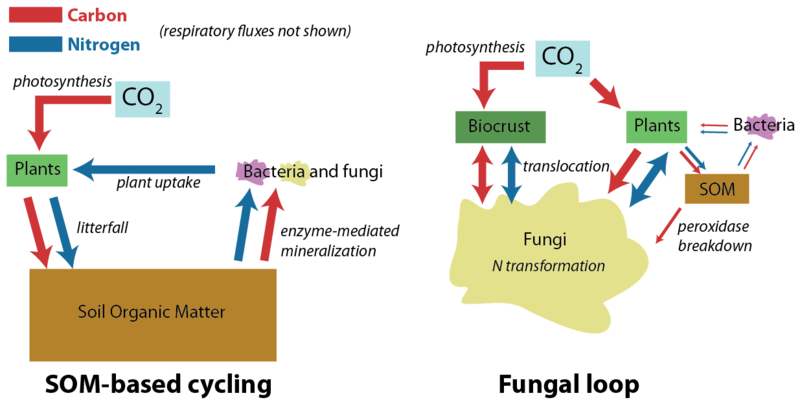 Much like the microbial loop, this non-standard pathway for C and N cycling in soils appeared to represent a fundamentally different cycling pathway in which fungi were key agents of storage, transformation, and translocation for C and N. These functions are normally more closely associated with soil organic matter and heterotrophic bacteria in wetter ecosystems. I have also heard some rumors that tropical ecologists have been thinking about an alternative “loop” of their own. This makes a lot of sense to me because carbon and nutrient cycling is much more associated with the massive amount of living vegetation in tropical forests than it is in temperate ecosystems. I think this is a really exciting area of biogeochemical theory, with the potential to revolutionize our understanding of how these basic cycles vary among biomes. As more tests of these hypotheses enter our syntheses and the true nature of these alternative loops are understood, we may be partially rewriting and definitely expanding our knowledge of how these key biological elements are cycled in the biosphere.